Christmas Morning Casseroles. So many options, so many choices. Tradition vs. something new. 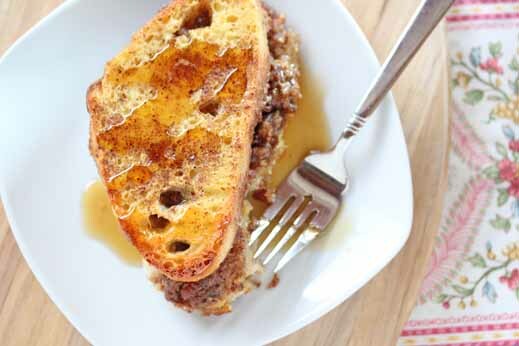 It’s a basic stuffed french toast bake. That I hopped up with pecan streusel, and egg nog. 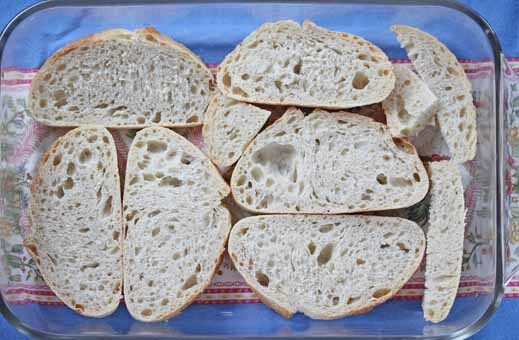 I used a sourdough loaf bread, because that was what I had on hand. (1 lb. loaf sliced, was perfect for this size dish.) 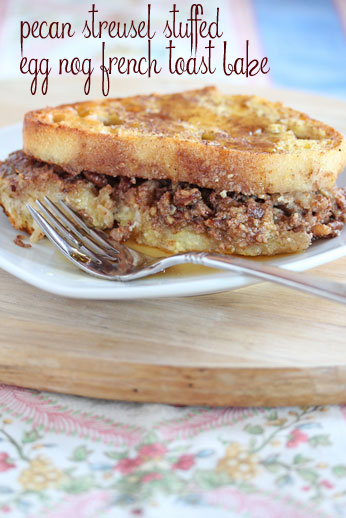 Pulled or torn french loaf or any other stale loaf bread would work with this…just add a layer of torn pieces, then the pecan mixture, then more torn bread on top. 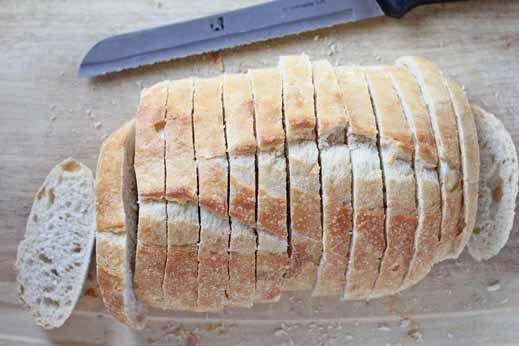 Add a layer of slices to the bottom. I cut up the smaller end ones to fill in gaps. Add the pecan and brown sugar mixture. Spread evenly. Add the rest of the bread. Pour egg nog-egg mixture over the top. 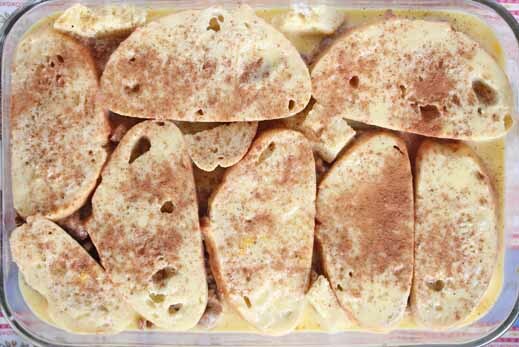 Sprinkle with cinnamon and nutmeg to cover the top lightly. Cut out a slice. Serve with maple syrup, syrup, powedered sugar, or as it. Preheat the oven to 350. Lightly grease a 9×13 inch glass baking dish with non-stick cooking spray. In a mixing bowl, whisk together the eggs and egg nog. 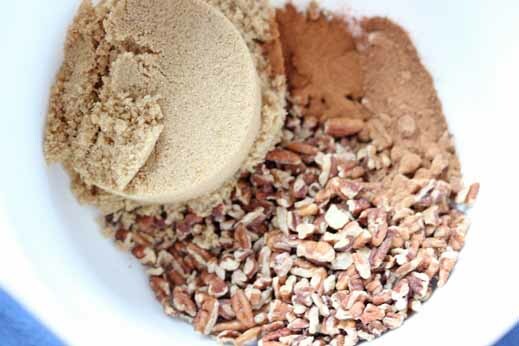 In another mixing bowl, blend together the pecans, brown sugar, cinnamon, nutmeg and butter with knives/forks/pasrty blender until crumbly. 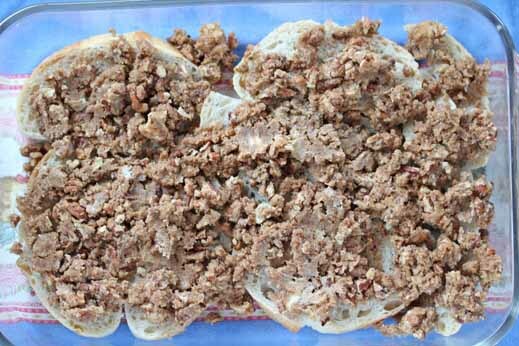 Add a layer of the sliced bread to a 9×13 inch casserole, then spread out the pecan streusel, then top with another layer of the bread. Pour the egg nog-egg mixture over the top. Sprinkle a little cinnamon and nutmeg on top, covering lightly. Serve with maple syrup, syrup, powdered sugar or as is. Along with some fresh fruit, bacon or sausage…for a complete holiday brunch! What’s your Christmas morning tradition? Casserole? Quiche? Do you brunch, or breakfast and lunch? Are you a traditionalist, or do you like to experiment with new recipes? Disclosure: This post is part of a sponsored campaign with Safest Choice Eggs. All opinions are my own. Thanks for the baked French toast recipe. 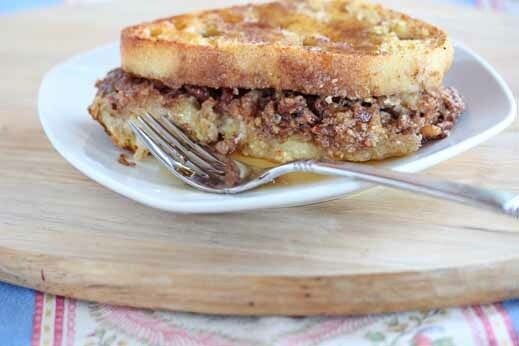 This is a great holiday breakfast idea to fill the whole families stomachs. Delicious recipe, but hardly $5 from where I’m from. The egg not alone is $3.49 for the cheapest off brand and smallest container.